Seven iOS 12 security settings you should check right this second! Apple’s latest mobile software, iOS 12, tightens up security and privacy issues on iPhones. To get the most out of the updates though, you might have tweak a setting or two. Here’s how to take full advantage of the latest bug-fixes and make sure you’re keeping your device as safe as you can from hackers and prying eyes. Apple didn’t change the default lock screen from a four-digit code to six digit one just to mess with you. The longer your device passcode is, the harder it is to hack. Hackers often use software to cycle through every possible passcode combination — known as a brute-force attack — and since a four-digit passcode has just 10,000 possible combinations, it doesn’t take long for a computer to break right in! If you’re still using a 6-digit or, heaven forbid, a 4-digit passcode it’s time to upgrade to something better. You can make passcodes as long as you want, and you can set it to use numbers and letters or numbers only. I prefer numerical only because then I don’t have to mess with the keyboard, but go with whatever works for you. Just know that if you’re still using 111111 or 123456 — you’re begging to be hacked. 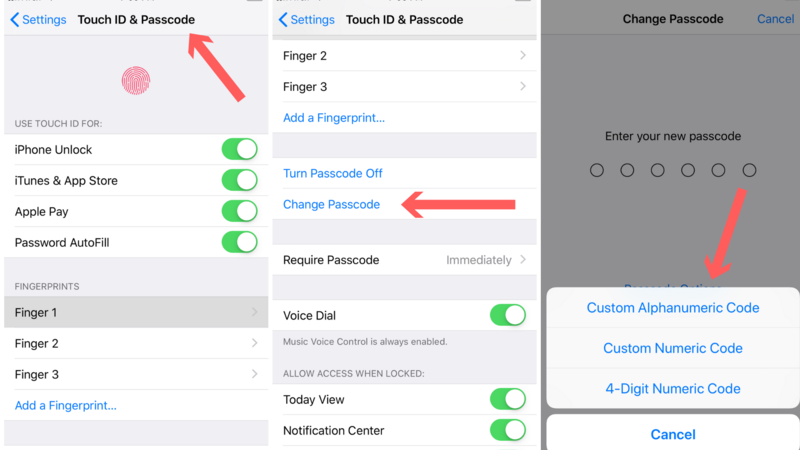 Go to Settings > Touch ID & Passcode and enter your current passcode. Then, go to Change Passcode and, from the Passcode Options options, set a Custom Numeric Code. Two-factor authentication adds an extra layer of security to all your logins by asking new devices to confirm that they’re legit. After you log in to an app or site with two-factor enabled you’ll get a text message to your phone number with a verification code, ensuring that you’re the only one who can access the account. Apple has two-factor support baked right into iOS 12, and it’s so incredibly easy to use that it auto-fills the codes for you — so you don’t even have to type them in. Go to Settings > Password & Security and then tap Turn on Two-Factor Authentication. Once you do this, your phone guides you through the rest of the setup process. One of the most significant security changes in iOS 12 is that Apple made it much harder for iPhone thieves or privacy-snooping meddlers to sniff your phone for information about you. When you plug your phone into a USB device it can do two things: get charged and transfer data. In the past, when you connected your phone into a computer, it asked for verification to keep you safe, but there were still tools that hackers could use to get around that. After seven days without being unlocked, iOS 11 would finally lock down the charging port to prevent any attempts at breaching its security. iOS 12 shortens that time window in a big way. Now, it locks down iPhone’s charging port into power-only mode after just one hour after you last unlocked it. To set this correctly, head into Settings > Face ID (or Touch ID) & Passcode and then go all the way to the bottom of the list. There you’ll see a toggle for USB Accessories. Make sure this button is OFF (gray, not green). This simple step should prevent any USB devices from trying to break into your phone after just one hour of being locked. 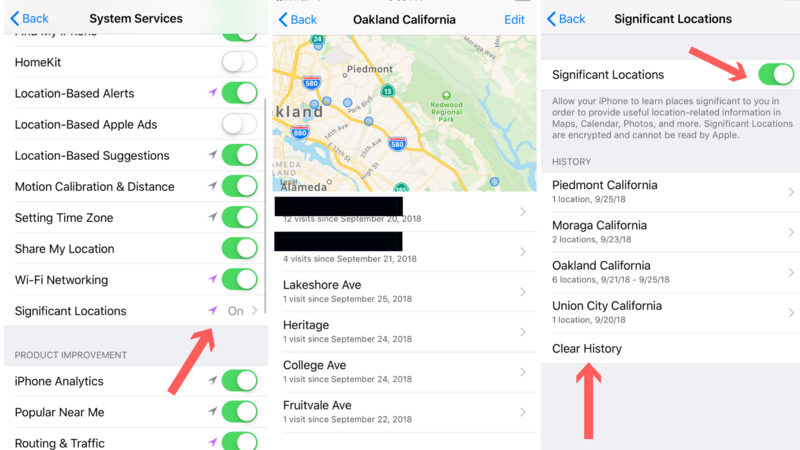 Your iPhone tracks everywhere you go so it can make location-based features in apps like Maps, Photos, and Siri work smoothly. Your phone encrypts the information so nobody should be able to see it but you, but it’s pretty creepy the first time you see it, especially if you don’t realize that it’s tracking you in such a way. It’s entirely up to you whether you want to turn it off, or you can clear your saved locations any time. Head into Settings > Privacy > Location > System Services and then tap Significant Locations. Here you can see the locations that your iPhone thinks are most important to keep track of and toggle the feature on or off. There are approximately a million web browser options in the App Store, but Apple’s own built-in Safari browser comes packed with new features in iOS 12 to help keep your browsing habits more private. Safari now protects against cookies that track you across the internet, following you from site to site and potentially revealing your browsing habits to companies trying to learn more about you. Social widgets on websites — like Facebook logins for comment sections — can sniff out what you’re doing even if you don’t interact with them. Now, Apple blocks all of those by default and even masks your phone’s unique identity so that advertisers don’t flood you with targeted ads. Using Safari in iOS 12 should put you ahead of the privacy curve already, but your iPhone’s password manager has a somewhat hidden feature to keep you even safer. Go to Settings > Passwords & Accounts > Website & App Passwords and you’ll see a long list of all the passwords that iOS knows you use. But it doesn’t just list them for you; it also compares them against each other to see if you’ve been reusing the same password for multiple apps or websites. If it notices a duplicate, you’ll see a little warning icon next to the URL or app name. Confession: I pretty much use the same password for everything — so don’t feel bad if before now, you have too. The main recommendation here is to use different passwords for every single site. Why? It prevents password reuse attacks — called “credential stuffing” — and makes it harder for a hacker to break into multiple sites and services using the same username and password. Go to Settings > Passwords & Accounts > Website & App Passwords and enter your passcode. You’ll see a small warning symbol next to each account that recognizes a reused password. Then tap Change Password on Website button and change away. Rather than thinking of dozens of different passwords, this is a good time to enable a password manager like 1Password or Dashlane. Or, use a quick trick you can easily remember, such as using a similar password, but with a specific add-on for each unique site. Keep your phone in auto-update mode. Apple isn’t perfect and every now and again, a privacy or security bug slips through the cracks. Apple is among the best at patching these holes quickly, and if your phone is in auto-update mode, you’ll get those patches as soon as they’re released. To enable automatic updates, head to Settings > General > Software Update and make sure it’s set to ON.